Rollins’ Phi Delta Theta fraternity has been suspended until at least the year 2021. Last spring, the chapter was investigated for sexual harassment, disruptive behavior, hazing, and substance abuse. While the investigation found the fraternity not guilty of all charges, on May 16, Phi Delta Theta’s national headquarters initiated the long-term suspension. “There were no college policy violations, but there were national headquarter violations,” said Meghan Harte Weyant, associate vice president for student affairs and dean of students. The fraternity’s national headquarters were concerned with the chapter’s engagement in risk management policy violations, such as high-risk behavior of using drugs and alcohol, disinterest in campus activities, and failing to meet national fraternity requirements, Weyant said. In March, the chapter was placed on an interim administrative hold—otherwise known as a temporary suspension—as the college launched an investigation after receiving a series of reports. The investigation was conducted by D. Stafford & Associates, a third-party firm that specializes in campus safety and security issues. Nick Baker ‘20, the fraternity’s former president, said issues started with the college long before the investigation began. “They were fishing for information the entire time. They were looking for anything they could get us on, but they didn’t find anything because we didn’t do anything wrong,” Baker said. “They used a time when we were vulnerable. I was a new and young president that was trying really hard to improve the fraternity’s reputation. They took advantage of that,” he said. Phi Delta Theta’s International Fraternity Council issued a statement saying, “Phi Delta Theta suspended the charter of its Florida Beta Chapter at Rollins College on May 16, 2018, for risk management and failing chapter operations.” The headquarters did not respond to any other questions asked by The Sandspur. Weyant said that during the initial suspension the fraternity held their formal, which was a direct violation, as all organization activity was prohibited. “While they called it something other than a formal, it was held in the same place and on the same weekend as the event was supposed to. Some students who attended were also under the impression that it was their formal,” she said. “We shared that information with national headquarters, and it was their national headquarters that voted to suspend the charter because of those risk management concerns they were already worried about,” she said. Phi Delta Theta was founded in 1848 and has 187 chapters and over 100 alumni clubs across the United States and Canada. Rollins’ Florida Beta chapter was founded in 1935. Although Phi Delta Theta’s national organization has an alcohol-free housing and anti-hazing policy, dozens of chapters across the country have been suspended since 2000. In September 2017, a freshman member of Phi Delta Theta at Louisiana State University died after an alleged hazing incident. His parents are currently suing the university, the fraternity, and several of the fraternity’s members, seeking $25 million. Rollins’ Greek Life also has a history of suspensions on campus. This is the third time in three years that this fraternity has been suspended at Rollins. In February 2017, all Rollins fraternities were suspended for nearly two months over high-risk behavior. That suspension was announced after a reported burglary and battery charge committed by members of one fraternity on those of another. However, at the time, college officials said this was unrelated to the suspension. 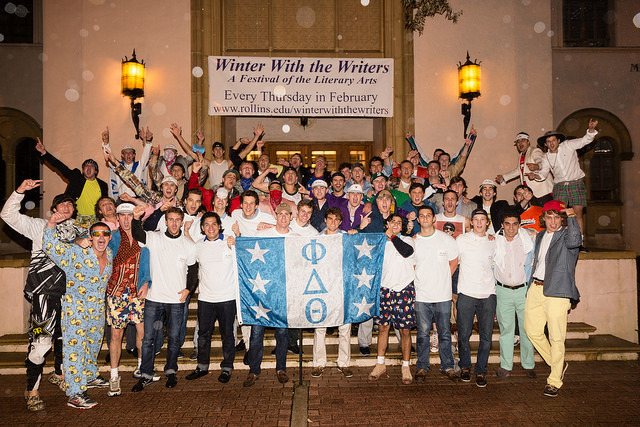 This may not be the end, though, for Phi Delta Theta at Rollins. The chapter could apply to recolonize with Rollins’ Office of Fraternity & Sorority Life (FSL) as early as fall 2021.